Did you want to see a falling star but don't have the patience? The next best thing is watching Iridium Flares. 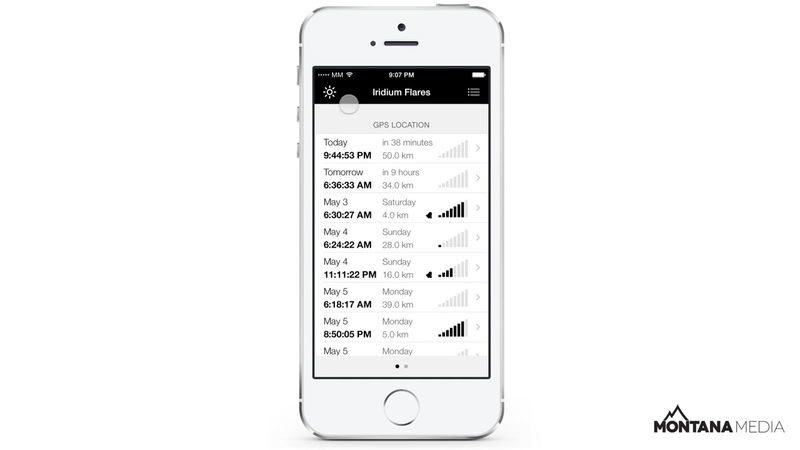 The iPhone app or iPad app tells you the exact time they'll take place and where to look in the sky. All data used in the application is loaded (with permission) from Heavens-above.com. So if the website is down for maintenance or another cause, data can't be loaded. Does the app take Daylight saving time into account? The app is stuck at the "loading location" message, what can I do? If you're inside a building or a place with a lot of tall buildings that block the GPS signal: try and get a clear view of the sky. If you've set the accuracy to very accurate (low value): change it to less accurate (higher value). Why does the compass sometimes points to the wrong direction? The compass in the iPhone and iPad isn't very accurate. To re-calibrate the compass you can wave the device in a figure 8 motion. What's the difference between Intensity and Centre Intensity? Intensity is the intensity at your location, Centre Intensity is the intensity at the flare centre. The Flare Centre is the point on the flares track which is nearest to your location, so if you want to get the best possible view, that's the place to be. You can see the flares track on the map at the flare details. iOS 5 doesn't allow local notifications by default, you'll have to turn them on in Settings -> Notifications -> IridiumFlares. Why is the direction of the flare on the info screen different than the direction to the flare center on the map? The map shows your location, the flare center and the path of the flare. The direction to the flare center isn't automatically the direction to look at the flare itself.